Join City of Cambridge departments as we take over City Hall and turn it into a Science Fair for the day! Play, learn, and create with us from 2:00 PM to 6:00 PM on Friday, April 12th. All participants in our scavenger hunts will get a prize! All you adults, participate and you’ll be entered to win a special prize as well. Q&A with the Public Safety group! Ask representatives from the Cambridge Police, Fire and Emergency Communications Departments about the science behind the work they do. Cambridge Energy Alliance: Solar Energy: Solar is the most affordable electricity you can buy and it’s not just for homeowners! Learn more about all the ways to get solar: from installing at your building, leasing your roof to community solar projects, solar sharing with your neighbors or joining the Cambridge Community Electricity Program’s 100% Green Plus. Climate Change Preparedness & Resiliency: The Port: Climate change means the future environment of Cambridge will shift to new averages and extremes for temperature, precipitation, and sea levels. Find out what the future might bring and what the City, residents, and the private sector are doing and can do. Cambridge Commission for Persons with Disabilities Film Showing: Unrest. Cambridge Energy Alliance: Energy efficiency: The cheapest and most environmentally friendly energy is the energy you don’t waste! Learn more about how your home can be more comfortable and have lower utility bills. Tips and free energy efficiency programs for homeowners, business owners, renters, kids and everyone in between. Cambridge Energy Alliance: Renewable thermal: Clean and green heating and cooling! Learn about why your next furnace or hot water heater should be an air-source heat pump or a solar hot water system. These technologies help you kick fossil fuels out of your home and can save you money too. All participants in the bike workshops get a free helmet! Visit CambridgeScienceFestival.org for full details! WHO CAN YOU MEET AT CITY HALL? WHAT CAN YOU DO AT CITY HALL? * Building Towers: Can you use these household materials to build a tower to hold up a tennis ball? A baseball? A stack of books? How tall can you make your tower before it falls over? * Colorful Creations: Use your imagination and science skills to turn coffee filters, markers and water into a colorful creature! Cambridge Geographic Information Systems (GIS) will provide the map layers and you use them to make a map of Cambridge. Learn how simple data can be combined to make a map showing neighborhoods, parks, water bodies, and more! Have a fresh pour of Fresh Pond! Did you know that Cambridge has a reservoir and waterworks system separate from Greater Boston? Find out what it takes to protect the reservoir and how we go from natural water to high-quality drinking water with the Cambridge Water Department. Stormwater Pollution – An Urban Threat to People and Wildlife: Find out how stormwater washes pollutants into our rivers, streams, ponds and lakes, impacting water quality. Fresh, clean water is important to birds, fish, aquatic invertebrates, plants and people. Discover what can you do to help reduce pollution. What happens to stormwater after it rains or snow melts? Come learn about watersheds, where stormwater goes and what rides along through the use of the EnviroScape interactive model. Enviroscape dramatically demonstrates water pollution — and its prevention and how a watershed works. EnviroScape programs communicate to people of all ages that we share responsibilities in preventing water pollution. Join TP+T for a hands-on learning experience about how we use traffic signals to help you stay safe when moving around the city. 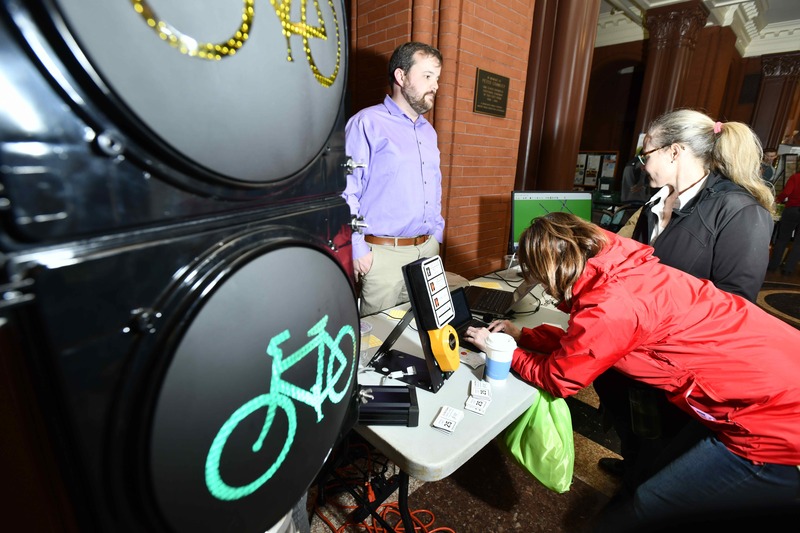 We’ll show you the insides of a traffic signal, let you simulate signal timing for any intersection in Cambridge, and educate you about what you can do to help us reach our Vision Zero goals. Complete a Vision Zero word search and we’ll reward you with a (little) traffic signal of your own. Trash or Treasure? Discover all the things we can give a second life by recycling or composting in Cambridge. Glocal Challenge & Communicating Climate Change! Come and listen to our youth entrepreneurs and interns pitch their ideas for how to communicate the realities of climate change in Cambridge. Give them your feedback, ideas, and innovations and help them towards implementation their projects this summer. Build a City Block! What does residential density look like? Want to see more affordable housing in Cambridge? Using an interactive game called Cambridge Streets, participants can design a city block to visualize different considerations and trade-offs when building different types of housing, creating open space and transportation options for all users. Extended Reality with the Cambridge Public Library: Experience Virtual Reality, Augmented Reality and a 3D “Photo Booth” — all part of the CPL’s new STEAM Initiative. Embark on a data scavenger hunt! Data informs nearly everything we do in the City of Cambridge. Join us for a scavenger hunt through Cambridge’s open data portal. Learn how to find data about the environment, traffic, housing, and all the other topics at the science fair! Sink or Float? Why do some things sink and others float? What happens when we encourage young children to ask questions and explore their ideas? Join the Cambridge STEAM Initiative for a science exploration activity designed for Preschool through Kindergarten learners. Sink or Float is a fun and engaging learning activity developed by the Cambridge STEAM Initiative at DHSP as part of the STEAM@Home project. Ride the energy efficiency bike and see energy efficiency in action, spin the wheel of energy and answer trivia questions about climate change and energy, learn more about making your home more efficient and run on renewable energy! Explore the science behind Sidewalk Poetry in Cambridge with a hands on printmaking activity. How would you like to meet Officers, firefighters, paramedics and dispatchers, participate in demonstrations, learn about the newest public safety equipment, try on gear, and receive free swag? As part of the Cambridge Science Festival, Cambridge Public Safety Agencies will once again be hosting the popular and FREE “The Science Behind Public Safety” event. Children, families and other participants will have an opportunity to meet and hear from representatives from the Cambridge Police, Fire, Emergency Communications, Animal Control, Pro EMS and State 911. The Cambridge Urban Agriculture Task Force, a work group of the Food and Fitness Policy Council, will present a report that looks at Cambridge’s urban agriculture policy through a health lens. Stop by and learn about the Cambridge Urban Agriculture Policy Initiative, the benefits of urban agriculture, and how to get started with gardening and beekeeping in the city.